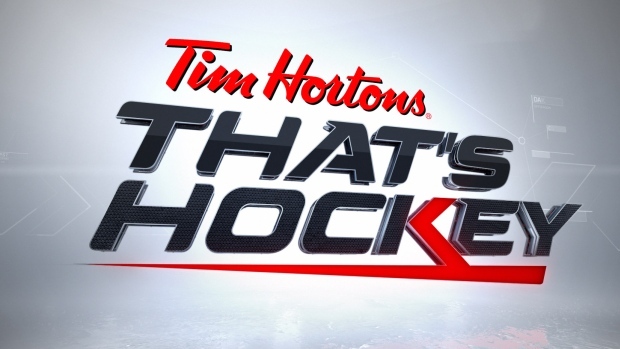 Just in time for puck drop on the 2014-15 NHL regular season, Tim Hortons and TSN today announced a partnership that will see Tim Hortons become the title sponsor of That's Hockey, the most-watched daily hockey show in Canada. The partnership begins today (Wednesday, Oct. 8) with Canada's favourite coffee brand featured prominently in the re-named Tim Hortons That's Hockey. Today's edition of the show, airing in a special 5:30pm et timeslot on TSN4 and TSN5, is dedicated to teeing up tonight's Leafs-Habs season opener. It features reports from TSN's panel of Hockey Insiders and experts on-site at Maple Leaf Square outside the Air Canada Centre in downtown Toronto. Beginning tomorrow, Tim Hortons That's Hockey moves to its regular timeslot of 7pm et weekdays (visit TSN.ca/TV for complete broadcast information). "Hockey in Canada is a natural fit for Tim Hortons. Our history has an intrinsic connection with this sport – it is a part of our DNA. From our founder, NHL great Tim Horton, to our presence in arenas, on jerseys, and in the daily routines of Canadians that love and play this incredible game," said Peter Nowlan, Chief Marketing Officer, Tim Hortons Inc. "We're proud of our hockey history, and this new sponsorship of TSN's That's Hockey is the latest way we are able to bring news about the game and its biggest and brightest moments to Canadian fans." "Tim Hortons is deeply rooted in the Canadian hockey landscape. They are a huge supporter of the game," said Nathalie Cook, Vice-President, Sales and Brand Partnerships, TSN. "We are Canada's top source for daily hockey news and Tim Hortons is the country's go-to choice for coffee, making this both a strategic and meaningful alliance for TSN." along with contributions from TSN's industry-leading team of hockey experts and analysts, including Jamie McLennan, Craig Button, Aaron Ward, Jeff O'Neill, and Dave Reid. Tim Hortons That's Hockey complements TSN's best-in-class NHL news and information programming, including That's Hockey 2Nite, SportsCentre, and the network's slate of signature NHL specials including TradeCentre, Free Agent Frenzy, Fantasy Draft, Top 50 Players, and Bob McKenzie's Draft Ranking. TSN's hockey programming also includes live coverage of the Toronto Maple Leafs, Ottawa Senators, and Winnipeg Jets as part of its package of 130+ regional NHL games. To access regional hockey games on TSN feeds, fans must live in the teams' designated broadcast regions (for more information, visit TSN.ca). Fans can also tune in to TSN Radio in Toronto, Montréal, Winnipeg, Ottawa, and Vancouver for radio coverage of regional games featuring the Leafs, Canadiens, Jets, Senators, and Canucks (visit each station's home page for complete broadcast information). My order: For well over a decade through my oldest boy's hockey career, I was all about the Cinnamon Raisin toasted bagel with light cream cheese and a medium coffee with milk. Standing by the glass in the offensive zone, using the dasher board to hold my Timmy's, watching my kid grow up on the ice. Now eight years later, with my oldest having moved away, I'm back in the same spot at the rink, watching my little guy begin the same journey. I'm a little older, so it's a Greek yogurt instead of the bagel, but I'm still "milk no sugar," and still loving the view at the glass. My order: Large Double Double with two sweeteners. I order it most often in the International Departures terminal at Pearson Airport when I'm purchasing my 144 premade packets of Tim Hortons coffee to take home to North Carolina. The ladies at Tim Hortons know me as "that guy who buys all that coffee." My order: Ordering Tim Hortons is an art form for me. Ninety-nine per cent of the time I'm in the car. In the old days, it was a 12 Grain bagel, double toasted with butter, a yogurt, and a large steeped tea with milk. Then it evolved to oatmeal with fruit, a yogurt, and a large steeped tea with milk. The latest incarnation of my order is the egg white breakfast sandwich with turkey sausage, double toast the English muffin and add a little ketchup, with a vanilla Greek yogurt, and a large steeped tea with milk. As you can see, the only constant is the large steeped tea with milk. My order: Medium, regular. Always. Seldom stray. I usually order it en route to my kids' hockey games or on my way to work. My weekend ritual is the Turkey Sausage Breakfast Sandwich. I always go to the same locations – all three are owned and operated by my good friend Matt Hanley, who has been an excellent supporter of minor hockey in the Whitby area. My order: Cinnamon Raisin bagel, lightly toasted, lightly buttered. With an orange juice. My order: I love the grilled cheese with chili on the side. I order that during winter when I'm coming to the studio to watch games and do a show. Thankfully, the Tim's location not far from the TSN studio is always there when I need it. My order: First of all, Tim's Dark Roast. Two cream, one sugar. Follow that with a 12 Grain bagel, double toasted, with light strawberry cream cheese.